Three hours doing the same rows of my knitting ! I’d decided to stick to smaller projects, nothing too fancy, using up a little yarn I already had. “Good idea!” I hear fellow knitters say (indeed I continued patting myself on the back for such a decision.) 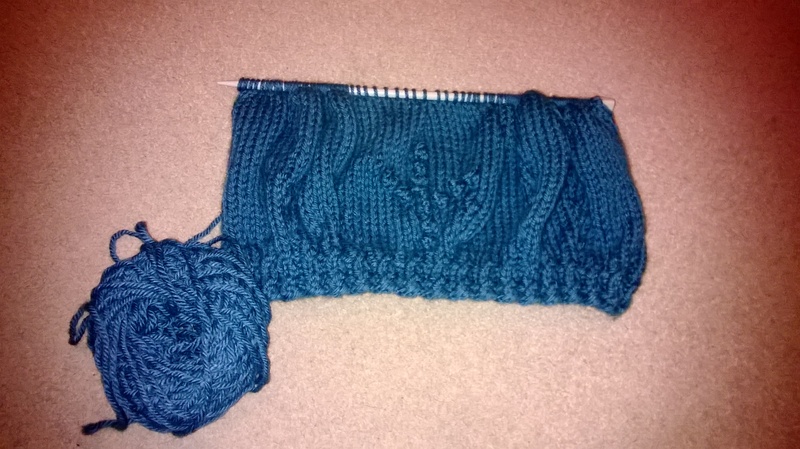 However, I still managed to jiggle the hat pattern around a little …. Oops, a mistake here, a wiggly pattern there, a few rows undone, a few rows redone. I guess it kept me busy on the 23rd December! Here’s progress so far. It’s been a bit quiet since the 23rd – somehow I didn’t get a chance to weald the sticks – hands were just too busy eating Christmas goodies, playing games with the family and so on. A lovely time we had. Tonight I shall return to the hat and see what happens. Hopefully it will be done and dusted and not reinvented. This entry was posted in Uncategorized and tagged knitters, knitting, yarn. Do I choose knitting projects beyond my capabilities? Recently I’ve been pondering this question and someone asked me kind of same thing today. I was contemplating a new ‘holiday’ project, something to throw myself into whilst off work for two weeks. I’d spent a while scanning several patterns and decided that anything with cables that had more than 8 pattern repeats were just not for me at this time. It would mean too much concentration and I could easily loose count, anticipating too much ripping and re-knitting (I need at least one project I call my ‘tv knitting’, I can watch and knit without counting too much). I was asked if I thought I would ever finish the item on the pattern I was contemplating as it was bigger than the recent accessories I’ve been making. So, am I too over-ambitious with my choices? Or just over- keen and I run out of time when making projects so I miss self imposed deadlines? Maybe I just can’t resist the lure of new yarn and patterns so give up one project too quickly to start a new one? I guess it could be a combination of all three of these. Knitting does seem to take up a fair part of my life. This time I shall not opt for a new large project. I shall continue with those I already have. I pat myself on the back for this and won’t take my purse next time I go into this shop! I totally forgot to photograph the birthday hat I finally finished! Oops! I rather liked it too! I ripped it out, changed to a pattern I’d done before which took me a couple of knitting sessions in just one day, then posted it off ! I had been good about taking photos – I am totally distracted what with all the Christmassy stuff, building stuff and family stuff going on around me. I can’t believe I’d tried to ‘design’ in a hurry when I should have just followed someone else’s pattern in the first place. It definitely wasn’t the time to have to think too much! The builders in my house arrive each day about 8am (did I blog that they were here?) That totally throws my routine as I am up and ready for action earlier than usual. I grab a quick bite to eat as they arrive, pop the kettle on for their morning cuppa, then try and hide somewhere in the house until they need me to fix the latest problem. Over the past week there has been a shortage of bathroom tiles, the wrong size shower tray and a radiator supplied damaged and only discovered damaged when unboxed. All problems solvable, just hassle. I pop out occasionally, looking for solace elsewhere. Today as soon as I had left they rang for the house alarm code – I could hear bells down the line and a panic in their voice – the new electrician had set it off and it wouldn’t stop! I can’t wait to have the work finished now as I am a bit fed up of the dust and chaos around me. Yesterday it seemed I had just half a room untouched, so I squirrelled myself away with the laptop briefly, then went to flush the loo discovering the water was turned off. Thank goodness for good neighbours who don’t mind me popping into them – they also give me coffee and yesterday carrot cake too! I can’t settle down with the knitting sticks and concentrate when the builders are here. I was thinking with all the time scheduled at home that I would get lots of knitting done! How wrong was I?! Yesterday evening I babysat a friend’s daughter – so easy to babysit a 9 year old – she slept, I watched tv in someone else’s tidy and clean house, took a knitting project and just relaxed! I have finished the gifts I was making for Christmas, and this birthday hat. 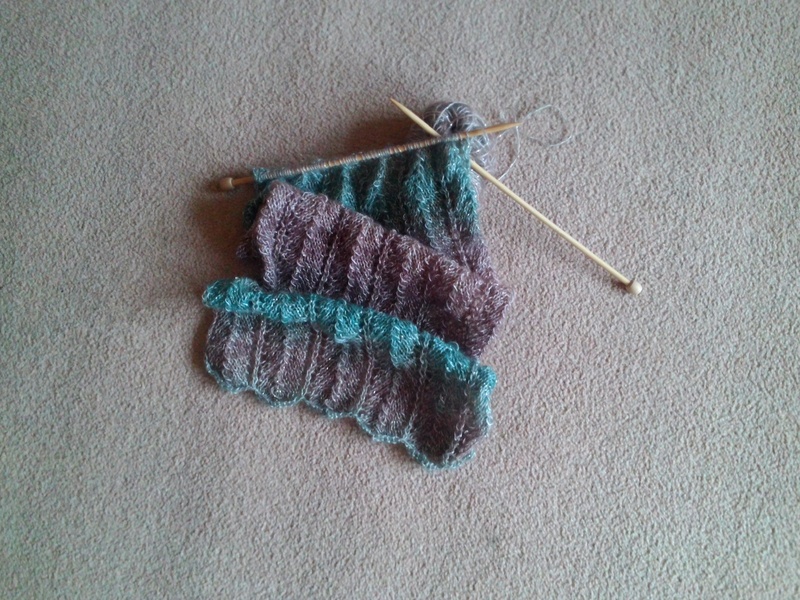 I can now look forward to finishing something for myself – a fantastic alpaca jumper – I so want to have it finished soon. I have reached a tricky part and have to ‘face my fears’ of continuing, without distraction, concentrate and just ‘do it’. I have also a newish baby set on the go – something I am working on for a possible new business outlet. No 1 boy has been a happy chap for a couple of days, and husband has absconded into work big time. He pops home to sleep – at least I think it’s him who left shoes in the middle of the kitchen floor last night – ready for me to fall over this morning, then move out of the way of the builders ….. ha ha ha NOT ! It has been a busy stressful week so far, and it’s only Thursday! There is still not much crafting going on in this house – well, I am not crafting in reality, but I am in my head, which still ‘counts’ and keeps me sane. I have a new knitting WIP, a chunky hat which will be a gift for a friend’s birthday on the 25th December – she always seems to miss out on her birthday treats what with it being Christmas Day too. I shall endeavor to finish this, pop it in the post, extravagantly wrapping it in Birthday Wrapping Paper! Unfortunately I have steered off the pattern and I am keeping my fingers crossed that the next couple of inches look ok and that I don’t have to frog it. I tend to do this, and have had successes and failures galore! Yesterday I read something which made me smile – a fellow knitter said she didn’t count her UFOs as WIPs. She was acknowledging the she had various woolly projects on pins that she wasn’t actually going to finish. I do not stress about my own projects not finished, but I admit I have started more things than I have completed. I might just have to admit that some of them won’t make it to fruition now – so WIPs become UFOs and that makes me feel a lot more comfortable! One in particular I know has a fault in the first few inches and I had thought it would not bother me when it was finished – but I know it will really – so I haven’t touched it in months. It is one thing I shall RIP out and turn into something else now. It cannot be finished and gifted as the error screams out at me! I am also sewing, but only ‘in my head’ ! The first meeting of my new sewing group will take place at the end of January and before then I shall have to have a craft project planned. Something very small, something manageable and fun, and of course in the right venue. Watch this space! As for family life – what a week that has been. My son has had a better couple of days, without actual taunting from the guys who picked on him the other day, but I know he has been worried, as have I. He has good friends who are looking out for him, all of them are passive rather than aggressive. He is avoiding getting in the same physical situation and being very strong and brave. I am proud of how he is dealing with it but inside I am still incensed that there are people out there who dare to fight their corner physically and in a crowd! I have reassured my son that his intelligence is a much stronger tool than those bullies who use their fists. This entry was posted in Uncategorized and tagged knitting, sewing, UFO, WIP, woolly. When do you learn how to be a grown up? I consider myself a mature woman, I’ve been around a while, have had a family, experienced a bit of life. I consider myself a ‘grown up’ most of the time (I hold down a job, make decisions without referring to others!) However, sometimes being a parent becomes more of a challenge and I look around for the ‘grown up’ to take over and realize that ‘grown up’ part of me doesn’t feel like a grown up and I am searching for someone else to know what decisions to make! Does anyone else do this? This week my son had trouble outside his school, bullies approaching him and pushing him around, accusing him of something he hasn’t done. When I had the call to go and collect him outside school I jumped in the car and did not know what I would find. Luckily, he was unhurt physically, but extremely shaken up. I was so upset for him, tried to be reassuring, tried to say all the right things whilst inside I was incensed and wanted to somehow get back at the other boys, find them and hurt them. I am usually such a passive person! I didn’t know what words to say to make him understand I will be there for him, I will support him, I will look after him and look out for him always. I didn’t want him to be even more stressed, to worry day after day that it might happen again. I had recently read a quote a friend had seen that said ‘you mess with my son/you mess with me’. At the time I smiled to myself and thought I have a good lad, someone who stays out of trouble and makes me proud. Yes, I DO have a good lad, who stays out of trouble, who makes me proud. It’s just that losers in this world sometimes cross our paths and we have to deal with them. I hope my words of comfort were the right words. That has been a true lesson in learning to be a ‘grown up’ for me. I guess that means when you do become one you know what to say and how to behave. I usually blog about my crafting, but the past week has been chaos with builders working and not much crafting has been going on! I decided yesterday to sort out my woolly stash, mid way through which I had the call from my son. Today I couldn’t face returning to the pile of chaos. Tomorrow’s another day. This entry was posted in Uncategorized and tagged bullies, crafting., grown up. Last week – what a ‘mare’ ! It seemed every time I spoke to someone, turned on my social media pages or checked emails that there was some different disaster happening to a friend or family member! I could only foresee 25th December looming without any kind of celebration and to tell the truth began shouldering everyone else’s issues as well as my own. I joined a sewing group this year. We were a bunch of ladies who met once a month for a coffee, show and tell, sometimes learning a new sewing skill. It was all quite casual for members, although I imagine more difficult for the leader to co-ordinate everyone. I helped post things on the social media page, keeping the ‘chat’ going when we weren’t together. Then, suddenly last week, the group shut down – no warning, no conversation – and the members I know started contacting me and asking me why, bemoaning the lack of notice, telling me of their disappointment – including the cancellation of a delicious afternoon tea we were to partake in next weekend in lieu of a Christmas night out. I too was disappointed. I could not contact the leader easily. In the end I had a rather blunt message, from which I sense it had all just become too much and the sewing group was something that ‘had to go’. After just a day I decided that perhaps I should resurrect the group, in perhaps a different format – so (for my sins) I have started to sound out members about still meeting up. I am hoping it is not too much hard work for me! It was something I was really enjoying, away from family ‘life’ and I met likeminded people there. Secondly, work…… well, there was a Christmas Fayre planned in the street where I work. I had been unable to work out what the boss wanted out of me towards this exactly. It was planned in a matter of just a few weeks. It was planned by my boss and a new member of staff who was given the task after one day of being employed. I am not sure the new colleague was able to present what she promised. I do not think my boss realized how much work could be involved. I felt usurped as a member of staff at times. Still, it went ahead, it seemed a success, although I am happy it is over. I went, I worked, the boss seemed happy. Thirdly, work …… well, it should be the busiest time of the year. It does not seem as busy as last year, sadly. I attempt to increase sales with different marketing ideas. Many of my ideas are not accepted. I feel frustrated often. Fourthly, if you are still reading this …… my husband had a complete meltdown in his job. Early in the week a colleague upset him which resulted in a couple of tense emails between them – they sit practically side by side! Later in the week, the same colleague and two of his staff hid a work problem and when hubby found out he went crazy – saying words not usually uttered in the workplace and leaving a meeting room in a rage. My husband is a really honest and hardworking man. He does not suffer fools, and has so much loyalty to his employers and his customers that sometimes work takes priority over us at home. He has been there for 32 years. After a little cooling down, all was well, but I have never heard him so disappointed with anything at work. Last (well second to last) – Workman and DIY at home. Having stuff done at home is always a little testy! We are not natural do-it-yourself-ers. New door in by workman, unfortunately not fitted quite right. Fixing has been delayed (well, almost having to fight with them to come back actually!). Door painted by husband – cold climate, paint not drying very fast at all – can you imagine another day with the cold from the outside coming inside and the knowledge that when the door eventually closes we shall have it stuck into the doorframe? ……. Finally, lovely husband remembered he used to enjoy making Saturday night dinner. He decided to make sushi for the very first time. We waited with baited breath. We heard cross words, some slamming about from the kitchen, stomping along the hallway …. and a sad face around the lounge door telling us it was a bit of a disaster and we might be having cheese on toast instead! Luckily with a bit of help (mine!) it could be rescued. Sushi tasted lovely, just maybe not quite as tightly rolled as shop- bought. It hasn’t put him off luckily – just needs a lot more practice! I love the fact Saturday night dinners made by hubby may be resurrected! With all this going on I did manage to do a few nice things, knitwise. The picture is showing off a cowl made as a gift. I did not finish the wrap I had promised myself but I know as it’s for me that I can wait. I also started a new baby cardigan. I have plans to sell some of my wares. This is a trial piece, and one I started in a café where I sat and knitted in a corner quietly It was at a pretty place in a little town called Chislehurst in Kent, UK. It appears quite ‘chic’ with a few tables with white linen and china cups and things around the whole shop to look at and buy. It is quite ‘chic’, I guess! I am not sure what they thought of me knitting for half an hour but two members of staff came and asked me what I was making and either feigned interest or were genuine! 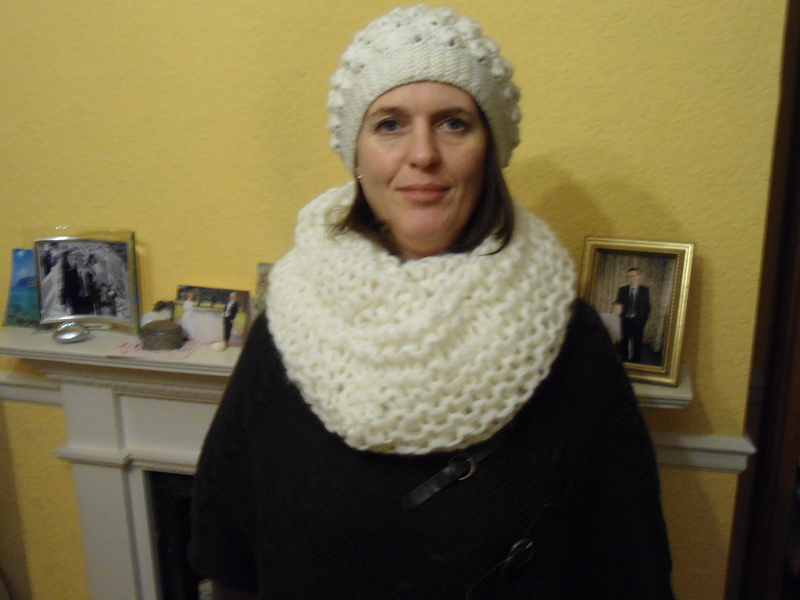 This entry was posted in Uncategorized and tagged Chislehurst, cowl, Knitted, meltdown, sewing.